I love marketing tools. Anytime I am playing with a new tool, I discover a new way to access and analyze data, build connections or put together new content assets. New tools give me new inspiration and hence thank you for sharing your marketing tools with me in your emails… Keep them coming! So What Made Their Email Pitches Stand Out? No need to be fancy: Be human! Some of the best pitches I couldn’t help noticing were those of just a couple of sentences long. It kind of helps if you know my name, but otherwise just say what you think is important. No need for long intros! Cyfe, one of the oldest tools in my list and one I’ve been using for as long as I remember, introduced themselves to me… when offering me a job. At that time I was happy where I was but it did prompt me to check them out and here I am, 5 years after that, still an active Cyfe brand advocate. Cyfe mentions include a few features in my Entrepreneur column, mentions on Moz and even Mashable. Since that 2012 email, we’ve become good friends and the tool has grown immensely. It’s truly a rare find! Serpstat pitches in Russian (as a native speaker, that’s something I hardly ever miss). Whatagraph pitch was longer but I still liked how it sounded. Plus they were so new, yet made it to ProductHunt. I was intrigued! Since then Whatagraph has made it to several of my articles and my readers seem to be always impressed! 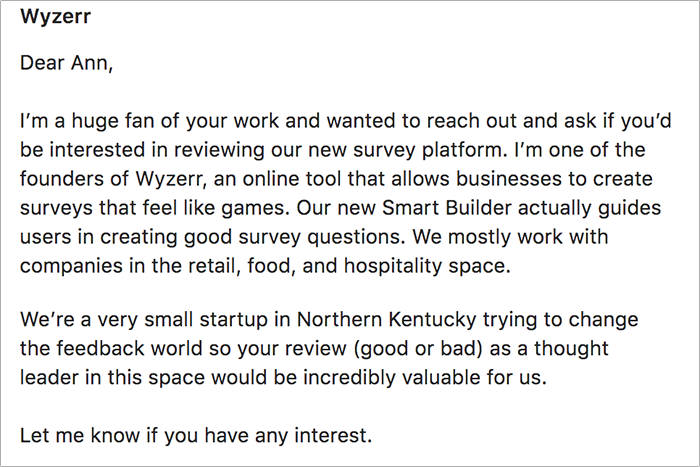 Wyzerr reached out on Linkedin (which is not something I check often, admittedly) but they sounded so legit and authentic that I gave them a try. Wyzerr brings a cool idea into this world: Gamification of online surveying which they explained well in their pitch? 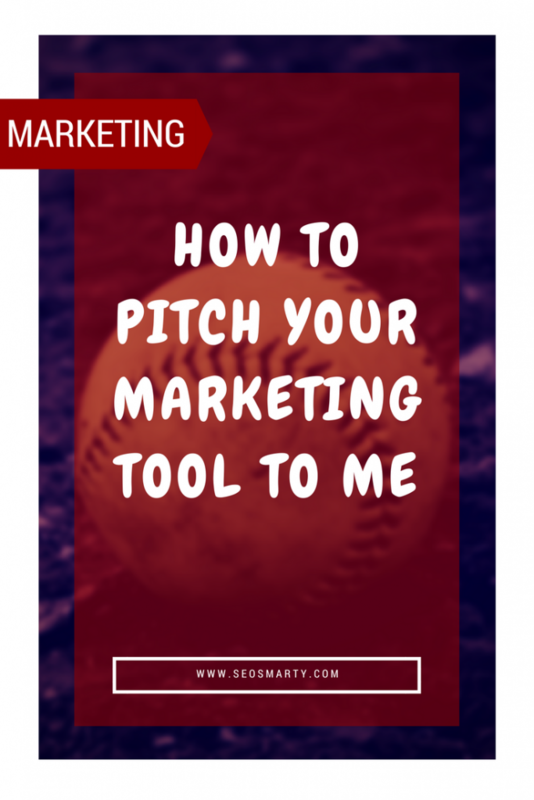 So how to pitch your tool to me? There’s a reason why I picked so different emails to give as examples of pitches that worked. There’s no single recipe. Just tell what’s on your mind! I love tools. I use many of them. Favorite tools come and go, some stick, but I try to spread a word about many! So if you have a tool to share with me, go ahead. I’ll do what I can, without asking anything in return. Because my job is to cover marketing tools, that’s how I have built my brand! Actually, there’s one thing in common there. None of those pitches came from a PR person. Somehow PR teams have the tendency of making emails sound less authentic and mostly intimidate me with the style and amount of characters. Also, try to make it easy. I don’t ask for a free access to your tool but it would be cool if you could include a link to a sample report, a quick video introducing the concept or a quick way to see a live demo project. Anything that would help me quickly understand what it does is a good idea. Furthermore, I can also help you with my content marketing services, so reach out in case you are interested! Disclaimer: Cyfe is my newest content marketing client which in no way is the reason why I included it into the above list. I love the tool and use it daily. 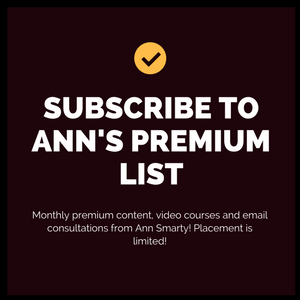 Thanks for the mention, Ann! I think it’s brilliant when bloggers share thoughts on the outreach emails they get – definitely helps us, people on the other end, improve and polish the pitches. Thanks Ann! Gonna try to pitch without a “PR person” as you suggest. Good stuff. I for one value pitches from trusted friends. Many wish to use Blogging From Paradise to spread their word but have little interest in me. Or my readers. If they help me without asking for anything, I know they are interested in me, and befriending me, versus only in what I can do for them. Huge difference. Excellent share Ann. Now I can understand why you are widely recognized. Thanks for your valuable share. I am an online entrepreneur and I always work hard for my company’s goodwill. Hope your advice will give me more business reputation. 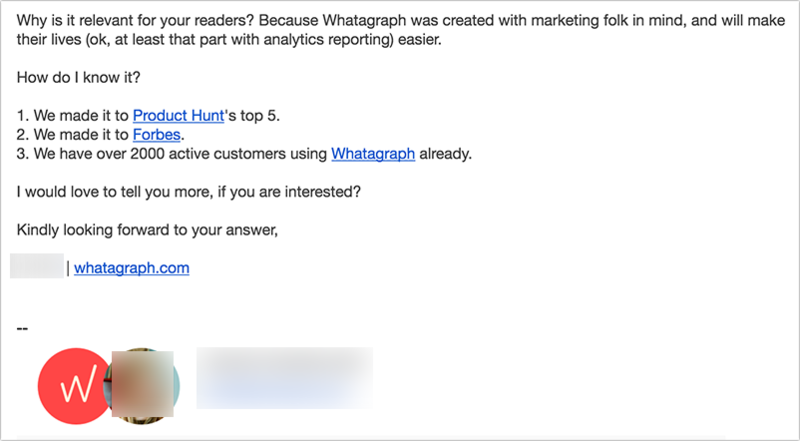 Thanks for the share Ann – I’ve actually received an email from a company not Whatagraph, but with a very, very similar pitch, i.e. ranked well on ProducttHunt, made it to Forbes, has such and such a following. Worked on me too, since I signed up to test the tool.